Claying Thoughts Pottery Studio is bright, homely and perfectly de-stressing. 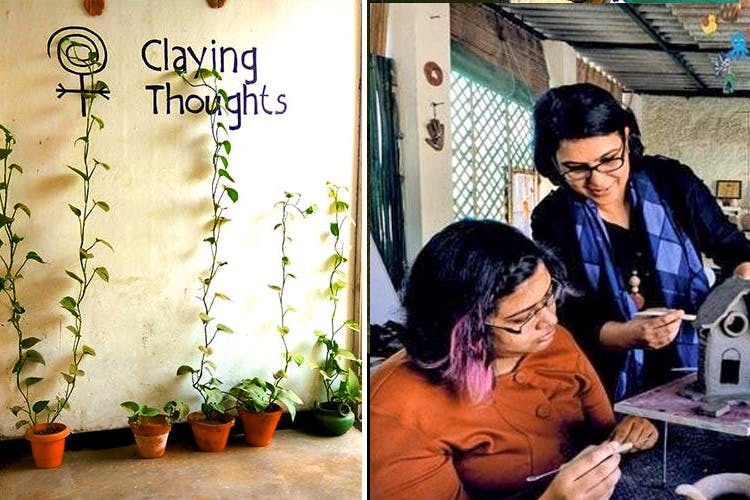 Pooja, a creative, ex-advertising person, has opened her Noida-based terrace to children, adults and tired worker ants who want to have a go at hand-building pottery. There isn’t a long-term investment or commitment involved at Claying Thoughts, and that makes it so much easier for us tentative, kinda busy folks. You start by learning how to prep the clay mixture, graduating to tile-based sculptures and finally to 3D artefacts. As you go higher up the learning curve, Pooja encourages you to become a full-fledged potter by teaching you how to fire your own pottery artefacts at home (no need for a professional kiln, yay!). Basically, you can experiment freely with that mud dough and fire away without any professional intervention. Plus, there’s no troublesome wheel involved in any of these creations and all you need is a toothpick, a sponge and a rolling pin. All this simplicity and the green cover that surrounds the terrace makes this a feel-good place for someone who wants to take up a new hobby. It’s a great chance to be hands-on and we’re told being creativity isn’t a prerequisite here—you can make disfigured figurines and not be judged for it. And if you’re really pressed for time, Pooja has one-day express workshops too. You can find the class schedule and other info on their Facebook page.